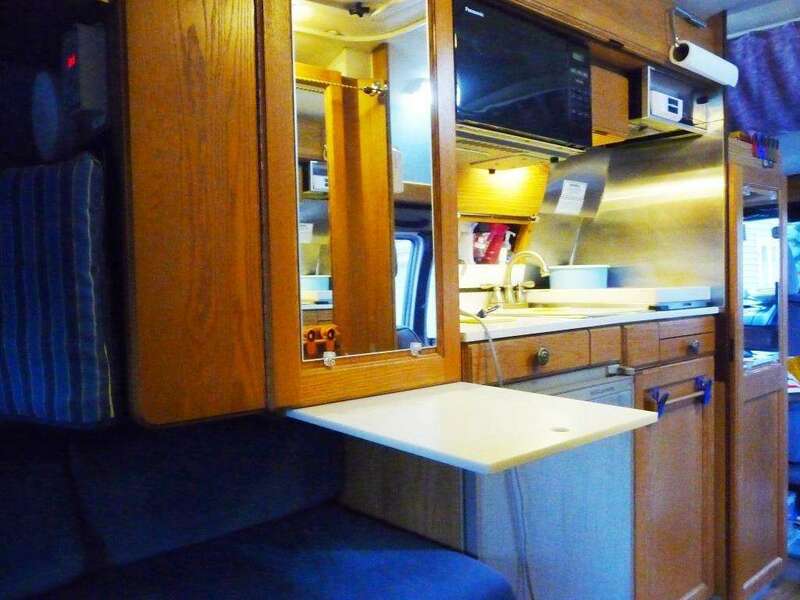 Space is at a premium in any Class B RV. Our experience with our own 190 Popular Roadtrek and visiting many other Class Bs is this: It pays to think seriously about the space you have, and how to make it feel bigger. Added mirrors on pantry and closet. Our motorhomes were identical for practical purposes. Red Rover's previous owner had installed a mirror on the pantry door in addition to one original mirror on the bathroom door. We noticed that it gave our Roadtrek a more spacious feeling than similar vehicles. We went to our local glass shop and had them install two more mirrors in Red Rover – on the closet and the clothes cupboard. The bill came to under $30 apiece for mirrors installed with clips rather than glued in. Suddenly the interior felt much larger because we could see reflections of space and light no matter where we sat. In other words, mirrors helped borrow apparent space. We noticed that some Class Bs look really small inside. They were dark and gloomy. Natural light enhances the apparent space, so we leave the curtains open in the daytime and make use of awnings (when possible) to reduce the heat, but keep the light and the view. We try to park where there's a pleasant view, so we borrow space from outside. We often find an attractive lunch site and back into a spot where there is a great view from the dinette. LED strip lines and dimmer over dinette. Electric lighting inside can make the space more interesting as well as appearing larger. Over the rear dinette is an original round light that is bright for doing work. We installed a LED strip light behind the ceiling cross member and equipped it with a dimmer. At night we often use only the strip light (which conserves power), and for eating we sometimes dial down the strip light so the ambiance is more romantic. That was so successful that we installed a strip light on the bottom of the shelf over the front passenger seat for map reading or book reading when we reverse that seat to face the rear. We saw how creating “islands of light” adds to visual space vs. overall harsh lighting. LED strip light as a porch light (cool white). Strip lighting is contagious! We put LED strip lights in the small toilet compartment making it seem larger. We equipped our kitchen with strip lights to brighten the counter space while cooking. The largest project was installing strip lights under the Fiamma awning. That string is on a dimmer so we can appear as the Great White Way at night or dial down to just provide safety. Strip lights come in warm white and cool white, interior and water resistant outdoor. We prefer the warm white color temperature. We also saw the difference interior color makes. Light colors add to visual space, dark colors shrink visual space. If you are selecting a new Class B, consider carefully the interior appearance and its effect on visual space. Leaving your bed set up reduces your living space – use that dinette! What about physical space? After carrying around our own clutter for a few weeks, we saw that reducing clutter actually makes the interior more spacious. We were surprised to find what we could leave at home and never miss it! Second, we saw some Roadtreks where the owners kept the big bed in back made up all the time. That is a space killer in our estimation, and we always make up the rear as a dinette every day. We thus have a large rear table and a small one up front. Each of us can work separately or change our lunchtime surroundings. Attractive pillows punch up the long benches (seating four for dinner or coffee) and make the decor pop. Computer & supplies storage box between seats. We became ruthless about eliminating visual clutter in many ways. Up front we built a computer and office box that fits between the front seats. It holds three laptops and their cords. In front is a plastic box containing a printer, scanner, and office supplies. The road atlas stores on top of the box and one or more dog bed pads cover the atlas. Our used RV came with a bulky old tube TV. We junked that and bought a 13″ 12 VDC trucker TV with flat screen and built in DVD. Can you downsize your TV and gain useful space? We made a slip cover for the TV so it blends in rather than looks like an ebony mirror. Spice box slides into small cabinet above sink. Labelled Eagle Creek bags hold a variety of items. Newer Roadtreks have a slide-out pantry shelf, but ours didn't. We made one that we can pull out from under the pantry cabinet for extra serving space, and push in when not in use (see first photo). Our under-counter shelves required us to drop to hands and knees to find the desired pan (always in the back.) We bought some ball-bearing slides and made pull out shelves so all the kitchenware is easily accessible and completely out of the way. A strip of marine board in front of the kitchen window created a shelf for the usual kitchen clutter. Some kitchens we saw had spice boxes and cans cluttering the counter too. We bought a bamboo box at Bed, Bath & Beyond and modified it as a spice box to fit a tiny overhead cabinet — presto! Clutter gone. We bought Eagle Creek bags to hold tools, batteries, charging cords, spare parts, etc. in the above the door front shelves. Labels make it easy to find things. Toiletries in shoe pockets on back of bathroom door. Motorcycle cargo net holds towels in place. Inside the toilet compartment door we hung some modified shoe pockets to hold toiletries out of sight. Above we found a way to hold towels and washcloths and a folding laundry hamper behind a motorcycle cargo net. Camp store refrigerator rods hold the net top and bottom so nothing falls out. Rather than piles of clothing inside the clothes cupboard, we built pigeonholes out of thin Masonite. Rolled clothes can be selected without tipping over piles. We added brass double hanging hooks in strategic places to hold clothes at night. Some nifty shallow slide-out drawers suggested we could build our own from Rubbermaid drawer inserts, and aluminum channels. Those hold keys, wallets, iPods, cell phones, and night junk. Our exterior cargo box on the rear holds a ton of folding chairs, screen rooms, caving gear, kites, and extra dog food. Cargo box swings out of the way so the rear door can be opened. This is by no means an exhaustive list of what we did to add to our apparent and physical space. We enjoy our space to the fullest, yet we are always on the lookout for new ideas. We visit boat stores, motorcycle stores, craft stores, and hardware stores. Camp stores are full of ideas. Our space program is dynamic — anytime we find something better we replace the old with the new. Look carefully at your Class B. What can you do to make it seem larger? How can you borrow space to make it live larger? What is it that is cluttering up your interior? What clutter can you eliminate? And how can you create practical storage for your necessary clutter? There are many great ideas out there, and you can probably dream up some new ones! Please tell us about your wonderful solutions to your space problems. where did you get your cargo box. Really loving it. Such great suggestions! I have a ’95 190P, so your setup is very familiar. I spotted your papertowel roll location – that’s something I’ve struggled with. And lighting lighting lighting! I too installed a strip under the awning, but got the one that has colors in addition to whites, and can mix, match, dim and flash… Never know what you might need. Was it hard to create the pull out drawers? I am thinking I would like to do this for the area where pans are kept. No more getting down on my knees. I am not super handy but can do it if I persevere. Thanks.